I haven’t posted in a long time. I’ve been tending to personal matters. Sometimes things are so big that there’s no room for anything else. I have been steadying myself and keeping my kids loved. News flash to myself: I can’t do it all by myself. It’s nice to have family and friends to lean on. While things are not settled yet, there’s now room in my head for something else again. So I’ll start writing again about something that gives me joy: fashion and shopping. I want this animal print coat with the embellishments that aren’t too too much. Genius. And the dress is perfect. Oh, and I need the jewelry and bag. I love this black wrap top over the slim skirt. Clean and chic. Just add accessories. Oh yes, I would wear this everywhere. 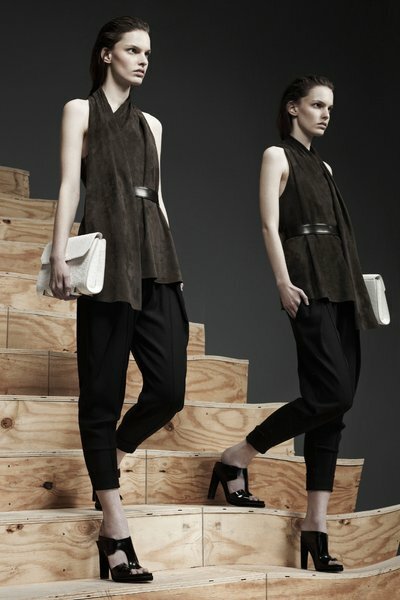 I love the sleeveless draped and belted top over those pants!!! I seriously need this top and the amazing buckle cowl. And hey, …. it’s nice to be back. All photos from The Cut at nymag.com.